Dr. Charles Baldwin Langford, was born on the 27th of June, 1867 to John Abraham Langford and the former Mary M. Grover. His parents were farmers and he was born in Harwich Twp, Kent County. Dr. Langford’s family moved to Camden Township in 1879 and according to the 1881 census, his father’s occupation was listed as storekeeper. Dr. Langford was the eldest of 6 children. His siblings were; George Sherman born in 1870, Ida born in 1872, John Stewart born in 1879, Alfred Edward born in 1881 and Rowena born in 1883. In 1882, Dr. Langford attended Toronto Collegiate Institute. In 1884, Dr. Langford pursued his medical studies at The University of Toronto Faculty of Medicine. He graduated M.B. in 1888. That same year, he received his M.D. and Master of Surgery from Victoria College. He interned at Toronto General Hospital. According to the 1928 Ontario Medical Register, Dr. Langford joined the College of Physicians and Surgeons on the 8th of May, 1888. Upon graduation he set up his medical practice in Blenheim on June 3rd, 1889. He purchased the practice from Dr. James Samson. The practice was located in one of the oldest homes in Blenheim located at 46 George Street. Dr. Samson had built the home in 1864 and today this home is included on the Chatham-Kent Municipal Heritage Register. Dr. Langford appears on the 1900 Ontario Business Directory as practicing in Blenheim. Dr. Langford’s home/office was equipped with a wire that ran to the stable behind his home to summon the groom to prepare is horse/carriage to go to a medical call. In the early 1900’s Dr. Langford purchased an automobile, but for many years he kept a cutter and sleigh for use in the winter, as car’s built in the early 1900’s could not manage in the snow. Dr. Langford married Jeanette Bisnet, on November 9th, 1892, in Blenheim. She was born in Blenheim on the 18th of May, 1870, the daughter of Alfred Luther Bisnet and the former Elizabeth Cameron. Her father was a manufacturer and he was the first mayor of Blenheim. Mrs. Langford as the 3rd of 4 children and her siblings were; Alverdue, Elizabeth and Charles. Dr. and Mrs. Langford had 2 sons, Charles Baldwin Langford who was born in Blenheim on the 17th of February,1894. He died a month later on the 2nd of March. Their son Grover Cameron Langford was born on the 9th of January, 1897 and he grew up to be a doctor. Dr. Langford was one of the founding members of the Blenheim Rotary Club in 1929. Dr. Langford was a member of the Masonic Order, the I.O.O.F. and held different positions in the United Church of Canada. Dr. Langford was a Kent County Coroner for over 50 years and he was active in the Kent County Medical Society. Dr. Langford enjoyed bowling in his spare time. 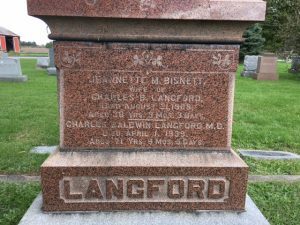 Jeanette Langford died on the 21st of August, 1908 and she was buried at Evergreen Cemetery in Blenheim. Dr. Langford married Elizabeth Evelyn Von Guten on the 27th of December, 1911 in Blenheim. She was born on the 18th of July, 1886, the daughter of Charles Lewis Von Guten and the former Sarah Ann Clemons. She had an older sister named Mary, a younger sister named Louisa and a younger brother named Carl. Her father was a jeweller in the Town of Blenheim. Dr. Langford served on Blenheim’s Town Council and he supported the Conservative party. Dr. Langford wrote and published a booklet called, “The First Five Years of Rotary in Blenheim”. Dr. Langford died on the 1st of April, 1939 and he was buried at Evergreen Cemetery. His wife Elizabeth died in 1962 and she was also buried at Evergreen Cemetery. Dr. John Malcolm Graham purchased the practice and the home of Dr. Langford after Dr. Langford’s death. *Dr. James Samson and Dr. John Malcolm Graham are also featured on the Chatham-Kent Physician Tribute website. 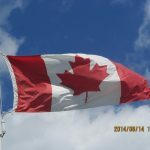 His cousin, Matilda Maud Langford married Dr. John Alexander MacGregor and Dr. MacGregor is also featured on the Chatham-Kent Physician Tribute website.